Relay For Life is the American Cancer Society's signature activity. It offers everyone in a community an opportunity to participate in the fight against cancer. Teams of people camp out at local high schools, parks or fairgrounds and take turns walking or running around a track or path. Each team is asked to have a representative on the track at all times during the event. Relays are an overnight event, up to 24 hours in length. No matter who you are, there's a place for you at Relay. Contact the American Cancer Society to participate, form a team or dedicate a luminaria candle. 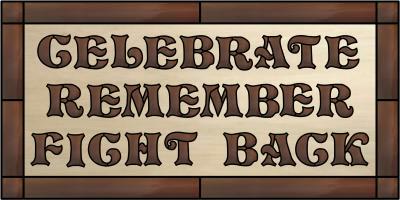 This year the charge is "Celebrate, Remember, Fight Back." My wife, Mary Ann, has been the chairperson of our event for the past two years. I wanted to do something to recognize her dedication to the fight against cancer, so I turned to my two hobbies: woodworking and stained glass. As I usually do, I turned to Glass Eye 2000. I have used it to design a patio, a garden layout, a gazebo, our home landscaping and of course, stained glass. I wanted to somehow incorporate the "Celebrate, Remember and Fight Back" theme, but in stained glass I thought it would look rather busy with all the lines from the letters to the border. So I turned to my other hobby, woodworking. For the design, I just made some borders as I would in a stained glass project and used a set of free letters I got from a website to spell out the words. It was quite easy to resize the design with Glass Eye 2000. Then, just as I would with a glass design, I printed a full-size pattern and taped it together. I chose to use two contrasting woods, a light alder and a dark walnut. First, I sawed ¾" boards into ¼" thick boards and glued them up into panels, one of alder and one of walnut, to get the width I needed for the plaque. Then it was a simple matter of stacking the woods and using double-sided carpet tape to hold them together. I put the "cartoon" created in Glass Eye 2000 on top, and I was ready. I took the "wood sandwich" to my scroll saw to cut out the letters. I needed to drill a very small hole it the corner of each letter so I could thread the scroll saw blade through the hole to make the cuts. Then it was just a matter of cutting out each letter (about four hours, try that with glass). 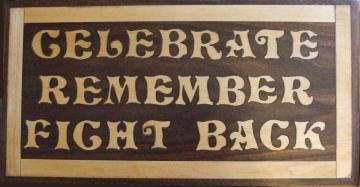 I then glued the background, letters and frame onto another ¼" plywood backing, and built a small frame around the plaque. When it was all glued together, I took the sawdust from that had been generated by the sawing process and did a "wet sanding" on the plaque. Wet sanding involves flooding the surface of the plaque with an oil finish (I used Watco Danish oil) and sanding (also adding the sawdust from the scroll saw) the surface. The sanding process generates additional sawdust which when added to the extra sawdust and oil, fills the small gaps (called "kerfs") between the plaque and the letters that were left by the saw blade. Adding oil, sanding and rubbing the slurry created from the sawdust and oil into the surface fills the kerfs with this mixture. After the oil dries, it binds with the sawdust and makes a sort of heart of the came we use in stained glass. Bruce is a retired aerospace software engineer and small businessman who loves to work in wood and glass. He has built two homes, including his own cabinetry and various other pieces. Bruce has been a woodworker for about 20 years and a stained glass craftsman for about eight years. He has never accepted a commission; he just makes projects for friends and family. You may contact him by email.